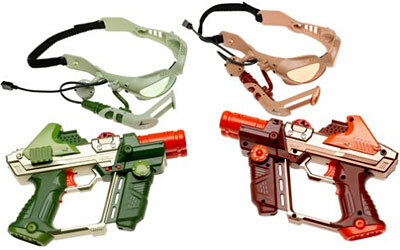 Step into laser tag gaming with this head's up display and tagger set. Display gives you audio and visual confirmation of being tagged and when you've tagged someone else. Know when an enemy is in the area and when you have your target locked. Features more than eleven pre-programmed games, LCD screen, advanced daytime IR quality, easy team-play programming, two HUD's and two laser taggers in each set.